Matthew Minahan was born in Chicago on September 16, 1859, the son of Robert and Jane Parker Minahan, Irish immigrants. By 1867, the Minahans lived at 416 S. Jefferson Street (now 1009 S. Jefferson Street). Robert worked as a railroad switchman. The family remained at the Jefferson Street address past the time of the Chicago Fire. By 1876, they lived at 224 Dekoven Street (now 767 W. Dekoven Street). Matthew still lived with his parents. He married Julia Mooney in 1880, and by 1893 the couple lived at 523 S. Union Street (now 1428 S. Union Street). Matthew was employed as a mail carrier. By 1900, the Minahans and six of their eight children lived at 719 W. 54th Place (now 623 W. 54th Place). They remained at that address for more than thirty years. Matthew died in Chicago on May 27, 1936. Julia died on December 8, 1937. The couple are buried at Holy Sepulchre Cemetery in Worth, Illinois. For further details, contact the Chicago Genealogical Society. 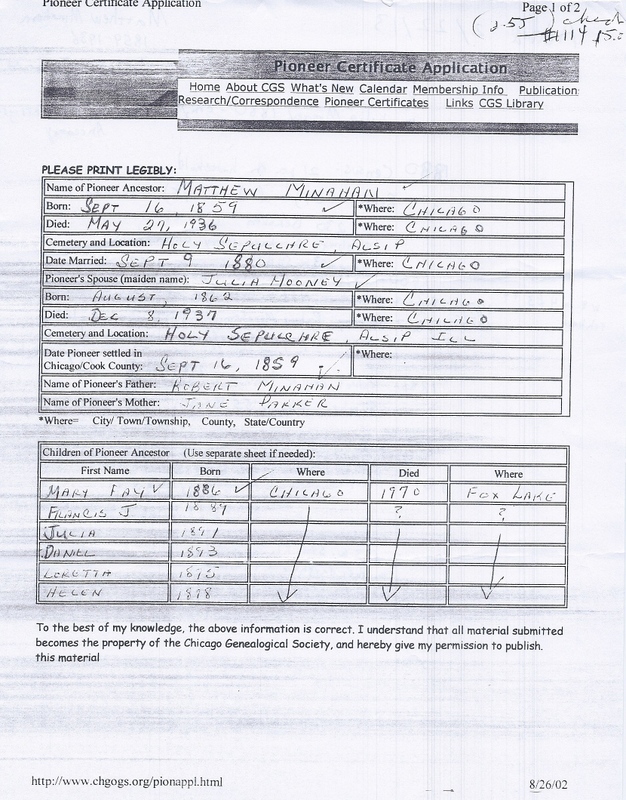 Matthew Minahan is Pioneer Ancestor number 255.